When someone is injured on private premises, it is often unclear who should be (or who might be) held responsible. A recent case in California state court illustrates the limits on who can be liable for accidents and where the duty of care lies. Continue reading for details about the case, and contact a Palmdale premises liability attorney with any questions about possible personal injury claims. The case of University of Southern California v. Superior Court concerns a fraternity party gone wrong. A student from a different school was attending a frat party at the University of Southern California (USC). She was dancing on a makeshift platform when someone bumped into her, knocking her from the platform and causing her to suffer serious injury. She sued USC and others, claiming that the school had a duty to protect her from an unreasonable risk of harm and breached that duty by failing to either prevent or shut down the party. USC filed a motion for summary judgment, arguing that it had no duty to prevent members of the public from the conduct of a third party at an off-campus fraternity party. The party was unauthorized as it violated USC’s social events policies, which limits events with alcohol to certain days and times. USC was aware that the fraternity had previously violated USC’s policies and that night had sent campus security officers to the party in response to complaints about the loud music but had not shut down the party. Despite these facts, the appellate court ruled in favor of USC. The court explained that defendants generally do not owe a duty to protect someone from third-party conduct unless the defendant has a “special relationship” with either the plaintiff or the third party, and the defendant engaged in a “negligent undertaking.” The court determined that USC had no special relationship with a student from another school and USC did not exercise control over the property where the injury took place. USC also had no special relationship with the fraternity because it was off-campus and it would be unrealistic for USC to exercise control over its activities. Moreover, the school did not engage in any “negligent undertaking” and did not assume a duty to protect fraternity guests by adopting policies regarding alcohol use and social events or by providing a security patrol on and off campus. Nor did the plaintiff have a reasonable expectation that the school would protect her from this sort of harm. 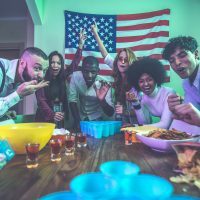 The intervening causes–the frat throwing an unsanctioned party, the acts of the other party guests, and the plaintiff’s consumption of alcohol and drugs–all mitigated any effect that any decision by the school might have had. As a result, the court ruled that USC was not liable for the plaintiff’s injury as a matter of law. If you have been hurt in an Antelope Valley slip and fall or other accident on someone’s premises, talk to a seasoned and dedicated personal injury attorney about pursuing a claim for damages by calling the Kistler Law Firm in Palmdale at 661-206-6990.